I didn't want to spoil the ending Season 2 in the title. And if you are reading this and haven't seen Season 2... go away now. I'm only issuing this spoiler warning ONCE! If you don't want Season 2, leave NOW! Oh, and, uh, by the way... this is a MASSIVE wall of text! Hope you like reading... you'll need the time to read a novel. Right, now that THAT'S been taken care of, I can start. Remember that video I did a while back where I theorize on what the potential relationship between Spyro and Cynder would be in Season 2? Yeah, turns out I was laughably wide of the margin. Then again, I did say we couldn't definitively conclude any possible outcome. And when I undertook this next matter... I really couldn't make a start. BUT I'm going to relay all the information I a have found and let the rest of you come to a conclusion. I am going to try to solve the riddle of Dark Spyro. Right, you've seen the subject. That's the LAST plot spoiler you're getting! OK, so it isn't the best quality shot... or the one that puts the most focus on the leaked script. But at least you can still make out a portion of the script; including the name Dark Spyro. OK, I'm gonna be name dropping here. Don't get mad if I spoil anything... I gave you PLENTY of warning and time to leave. So what do we already know about Dark Spyro? Well... very little. He is basically normal Spyro, but with all of his light energy having been drained away from him by Strykore. The result is that Spyro has become reckless and noticeably more evil than he normally is... not that he was evil to begin with. Reckless? Yeah, on occasion. Evil? No. Depressingly, Eric hasn't provided anything since Season 2 launched. Normally we have some cryptic clues to go off of and try to work things out. I've been fairly good at them, though not 100%. 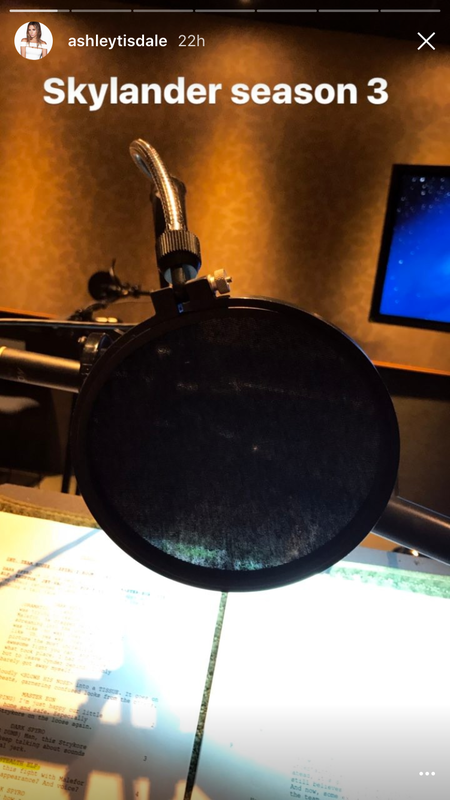 The only real clue we have is that Dark Spyro has a separate voice actor to normal Spyro. Spyro is voiced by Justin Long... Dark Spyro is voiced by Jason Ritter. That is unusual thing to note, but it could be important... is Dark Spyro even the same character as normal Spyro? I wish I could answer that... but I can't find anything to give you a definitive answer; there's just no hard evidence. All I have is wild speculation. The biggest problem also is that I can't quite find anything conclusive regarding how Dark Spyro will be used in the show; it's just a mess. Now, if we take a closer look at the leaked script itself, we might be able to work somethings out. Now, I'm not going to take the credit for most of what I'm going to say; much of what I'm suggesting was actually originally proposed by members of this here community. See? I'm including everyone in this! for a few beats, garnering confused looks from the others. now with Strykore on the loose again. changed your appearance? And voice? I want to draw your attention to where it says "PLAYING DUMB". The word "DUMB" can be plainly read in the leaked script (-ish), which is a pretty odd word to include in a guide-point. Why would that be there? Well, let me direct you to DarkanderTails - it was actually they're idea that Dark Spyro was "PLAYING DUMB" to begin with. Our good friend here has a theory that Dark Spyro is pulling a long con job for... reasons. To be fair, there is no clear cut reason other than working for Strykore, but that seems unlikely to begin with. I can see where they are coming from, since the script does suggest that the characters are unaware that Spyro met with Strykore and had his light energy drained. Stealth Elf herself questions why it was the battle with Malefor that caused Spyro to change like this. And we know that is not the case… although, we can’t see the next line of the script – probably for the better – so we don’t know WHAT Dark Spyro is saying in response. This is a children's cartoon; NOT a soap opera. Doing something like this is just way too much for the show! Can they do it? Sure, nothing’s stopping them, but would they do it for the audience? Probably not. Not to mention that if it were true, it would throw the main stem of the show completely out of whack. How long will Dark Spyro hang around for? Now obviously, we can't be completely certain of an answer here because we have no idea what episode number this script comes from. Only 2 seasons of the show were planned originally. Season 3 was given the green-light during production of Season 2. OK, it's a long shot, but it's the best shot we have at the moment. It's currently the ONLY thing we have to suggest any period of time with which Dark Spyro will hang around for. The theory I propose is that they cut the final episode off the end of Season 2, leaving the series on a massive cliff-hanger. Where did this episode go? Why, it's being re-purposed into the first episode of Season 3! Don't take a grain of salt, here; take the entire shaker. Have I got anything more definitive? Well, no sadly. There isn't much else we can use outside of soft-evidence. We just have NOTHING to back ourselves on. Spy Class Wrote: Well, this was a disappointment. When I said 'try', I didn't think that would translate as 'fail miserably.' I can't get ANYTHING out of the show! Guess we'll have to look to outside Skylander sources to try and get something. Well, there is the existence of Dark Spyro in the game canon. Let's look at that. Quote: Dark Spyro is more wild, erratic, and darker than his normal counterpart, as seen in his 3DS gameplay. While in this form, he is always at risk of being consumed by the dark magic. This process worries his fellow Skylanders at times as they fear that the evil forces may eventually corrupt their friend. Sounds very much like the show variant of the same character. But there's a catch: Dark Spyro in the games has learned to control this dark energy, and has even passed this skill down onto other Skylanders that have been affected by the influences of The Darkness as well. That doesn't mean the show variant WON'T learn the same trick, though. If such a case were true, you have to ask then who would teach him how to control his dark powers? Well, immediately two names come to mind: Eon and Kaossandra. While Eon seems the obvious choice, the relationship between Spyro and Eon was fractured greatly near the end of Season 2, so that could be a problem. Kaossandra, however, seems to make a bit more sense. She is, after all, the representation between good and evil - it would make sense for her to train Spyro in controlling his dark tendencies and using them for the forces of good, without having to upset the balance of good and evil in the world of Skylands. Graupel Wrote: At the end of the season, they do need all the help they can get, and Stealth Elf now has 3 reality altering wishes. And she hasn't used any yet? Wait... that's it! Of course! How I could I have forgotten that? (Because you haven't seen most of the show yourself, moron!) Whatever. This one detail right here opens up the door to a WHOLE story arc that we completely overlooked the probability of! I'll spell it out bluntly: Stealth Elf uses one of her available spells from Ninjini to convert Dark Spyro BACK into normal Spyro! And surprisingly... there's evidence that supports it! That'll be a first for today. JUST MAKE IT HAPPEN ERIC!!!!! Stealth Elf would probably be the only one close enough to Spyro to notice when he isn't being himself even slightly. And she has. She's questioning his change in appearance and voice; she can tell that something isn't right. She would then proceed to use one of her wishes to restore Spyro to normal and reverse Strykore's light draining effect on him. And bizarrely, this also seems to suggest that the split-season theory could be true. The 3 wishes was not brought up again for the rest of Season 2... and it's quite a significant thing to leave out. After all, they dedicated an ENTIRE episode to Stealth Elf training with Ninjini; surely, they wouldn't drop something that powerful and then literally drop it. It would have made sense therefore that she used her wishes in the season finale, which didn't happen. So where does this detail have to go? Season 3, of course! The only thing it DOESN'T prove, however, is that this all happens in the first episode. That's something I can't give a final answer for. But why stop at just THOSE ideas? You guys are smart (unlike me), so why don't you take to mind what I've relayed here - which is literally EVERYTHING I could classify as either eligible or loosely-possible - and try to expand upon them? Or work out some other ideas for yourselves. One kangaroo isn't going to solve this on their own; he's gong to need a little help from his friends to get anywhere. So... what do you think is going to happen regarding Dark Spyro in Season 3? True, but it held little value in light of anything anyone has come up with yet - myself included. Could be useful, though... couldn't find a place for it in the main "article" though. I need a life, don't I? in the skylanders academy season 3.
option #1: to take back spyro's old light from the strykore and to return back on spyro. option #2: or create a new light for the spyro. You posted this several times already, steven. I have removed his other comments, but this is contributing to the Season 3 predictions thread. What I hope to see is why Malefor doesn't consider Skylander as a good influence to Cynder. He doesn't see Skylanders as friends and seems to know from experience. (12-15-2017, 02:51 PM)CrystalBlazier Wrote: What I hope to see is why Malefor doesn't consider Skylander as a good influence to Cynder. He doesn't see Skylanders as friends and seems to know from experience. But isn't that mainly because of the whole "he wants her to be evil so her being friends with good guys is bad for her evilocity (got that from Kaos)" thing? season 3 will be awesome or lame? I was thinking more of a possible bad experience with them. That's old news now, mate. This thread is pretty much irrelevant now, since a lot of these predictions can be discarded. If I knew how to close the thread off, I would. (09-12-2018, 09:24 PM)The Primordial Clok-Roo Wrote: That's old news now, mate.